This is the first of 4 parts in my new Building Family Identity series. 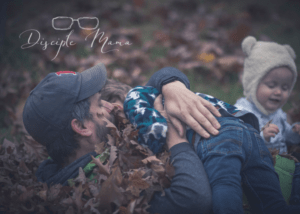 We’re entering the holiday season, and I want to spend some time this month diving into how we can be really constructive and intentional about our families and what we focus and place value on. 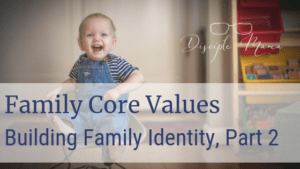 I’m really excited about this first installment, Part 2: Core Values , and Part 3: Family Traditions, as well as what’s coming! Stay tuned (or subscribe to the newsletter) so you won’t miss Part 4 in which we’ll be discussing family stories. What does the Bible say about identity? The Bible doesn’t take long to get into the subject of identity, and there’s a lot more on the subject in the Bible than I’m going to get to in this post, but for the purpose of building family identity, there are a few key concepts with which we need to be familiar in order to lay a strong foundation. We are God’s children, and we belong to Him. In the very first chapter of the very first book, God creates humans in His “own image,” setting us up to identify as His children (Genesis 1:26). In the New Testament, John also reminds us that God loves us so much that He calls us his children (1 John 3:1-3). God claims us as His own, and He calls us by name (Isaiah 43:1). God even goes so far as to tell us that our bodies belong to Him, because the Holy Spirit lives in us, and Christ has bought us with His own blood. There’s no doubt that as His beloved children, we are to root our identity in Him. As God’s children, we are well-loved. Actually, we’re loved perfectly. God is love, so by definition we were made to be loved by Him. Being made in God’s image means that we’re made to love others, as well. God couldn’t create a solitary being in His own image, because God can’t exist without someone to love–and we’re not supposed to, either. God wants us to see ourselves the way He sees us. God doesn’t want us to find our identity in the way we look, or the things we’re great at (or not so great at), or in terms of our worldly successes and failures. He looks at our hearts to determine our value (1 Samuel 16:7), AND He gives us a clean, new heart when we need one (Ezekiel 36:26)! God gives each of us an amazing identity in Him. I know it, and I hope you know it. But we have to go beyond head knowledge, claim our God-given identity, and live it. That part is harder for me. I still get hung up on my many imperfections. I have a hard time loving myself sometimes, and that makes it harder for me to let others love me. It’s a struggle, but Jesus is helping me inch closer to the goal every day. The thing is, if I don’t live like my identity is in Christ, I can’t teach my kids to live it. This is where the importance of family identity comes in. 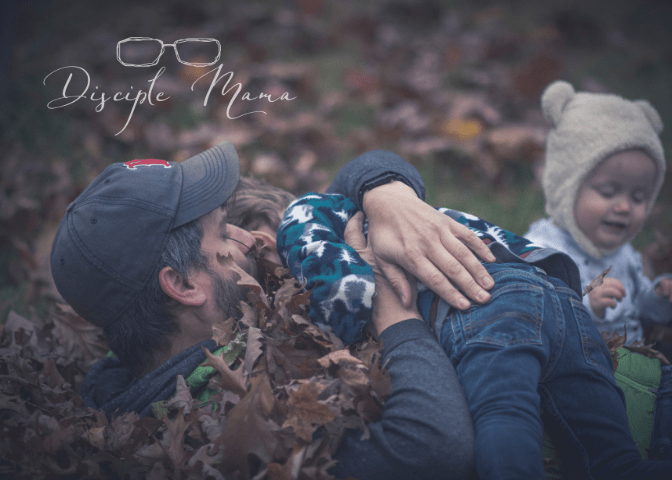 Why should we focus on building family identity? Discipleship parenting means that we focus on building our kids’ identities in Christ, which means we’ve got to build the family identity on the same Rock. 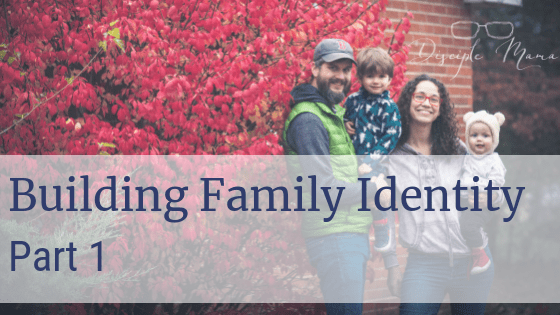 We’ve already talked about a biblical basis for forming our personal identities in Christ, but before our kids are ready for that, they look to their parents for their identities. The family unit is a model for the family of God. This is why God put families together: parent/child relationships model God/human relationships. This model has been corrupted by sin, but regardless, we are still the first examples of God that our children experience. It kind of makes sense that there’s so much in the Bible reassuring us of our identity in Him, right? We need it because our babies are looking to us to see what God is like. The family unit is the first place kids will have the opportunity to find their place in the body of Christ. Parents can help their children learn that though they all have different gifts, strengths, weaknesses, and personalities, they are all important, and the family wouldn’t be the same without any one member (Romans 12:12-31). This is a pretty major lesson to learn, and if learned well, children can be plugged in to active roles in your local church early on. 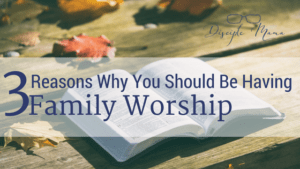 Family identity is made up of an infinite number of nuanced little influences, but in this series I’ll be writing about the three major components: family values, family traditions, and family stories. Each of these components is a legacy passed from generation to generation, and each contributes significantly to who we are. 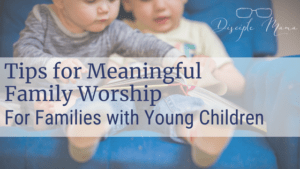 Intentionally building a strong, positive family identity with a foundation in Christ will go a long way toward helping our children feel deeply rooted in him when they’re going through identity struggles in adolescence and beyond. 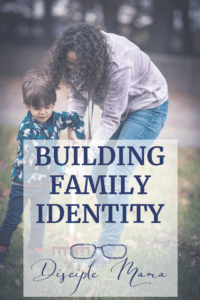 How do we build a family identity? Building family identity involves three major processes. The parents need to decide what they want to pass on. The children need to receive whatever identity components the parents decide upon. The good news is that as parents, we have a lot of control over the first step, but the bad news (perhaps) is that after that, we lose more of that control with each successive part of the process. The best we can do is pray over which values, traditions, and stories we pass down to our kids and do our very best to help them take in as much of that positive family identity, then we just have to trust our kids and their personal relationships with God to carry them through as they sift through our family identities, embracing and discarding what we’ve given them and starting the process again with their own children. It’s seems more tricky for Christians, because, honestly, what we’re really trying to pass on–when you boil it all down–is a personal relationship with God. My husband is a youth pastor, and when he talks to kids about forming their own personal relationships with Jesus, he has them do a few things. First, he has them partner up and instructs them to give an object, like a pencil, to their partner. Next, he asks them to explain how to do something very simple to their partner, like how to add 2+2. Then, he has them each kid try to get his or her partner to be best friends with their best friend. Obviously that last one is difficult, to say the least. It’s easy to pass objects on, it’s not too hard to pass on information, but giving someone else your relationship is impossible. All you can do is help someone get to know the third party, and pray for that new relationship to grow. Unfortunately, some of us are doing something even more difficult than trying to hand down a personal relationship: we’re trying to force a personal relationship on our kids to a God we don’t know ourselves. If you’re trying to introduce your children to Jesus without your own relationship with Him, you’re in for a real struggle. So, get to know Him yourself, and your kids can join you as you learn more about Him. Start wherever you are, but whatever steps you need to take to be a friend of God, take them. If we want our kids to identify themselves first as followers of Christ, we have to show them what it’s like to live life grounded in Jesus. We have to show them when we sit at home, when we’re out and about, when we lie down and when we rise up (Deuteronomy 6:6-7). We have to live and love a Christ-identified life and make it easy for our kids to learn enough about our Best Friend that they can’t help but want to know Him too. If you don’t want to miss the next part of the Building Family Identity series, sign up for the Disciple Mama newsletter to get updates on everything that’s happening here! Oh my goodness, yes, yes, yes! I love this so much. This really hit me hard: “If I don’t live like my identity is in Christ, I can’t teach my kids to live it.” Absolute truth. It’s a lot of responsibility, but it’s so simple, too! This is such a great post! Thanks for sharing it on Grace & Truth. I have chosen it as my feature for this week. Hop on over to my site tomorrow (Friday) and get the “I Was Featured” button to place in your post – just right click the image and choose download. I am sure your post and series will encourage many families to live for the Lord! Hi, Aimee! I’m excited to be featured! Thanks for stopping by my blog, I hope you’ll come back soon! I so love this line, “If I don’t live like my identity is in Christ, I can’t teach my kids to live it.” So, so, so true!! 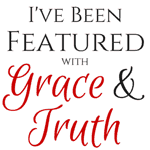 Congratulations on being featured on Grace and Truth.